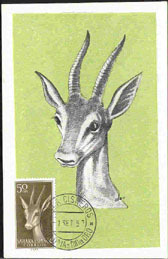 15094 MAX SPANISH SAHARA (1957) Mountain gazelle*. Maximum card with First Day cancel. Scott No 83, Yvert No 122. Attractive!